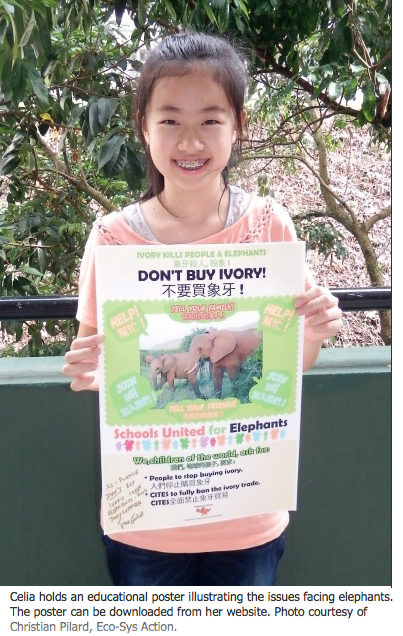 “I take every chance to share my campaign and the difficulties elephants are facing,” says Celia Ho, a 14-year-old student from Hong Kong who launched a campaign to stop ivory consumption after reading Bryan Christy’s “Blood Ivory” article in National Geographic. Her young voice represents a new hope for elephants that is increasing throughout Asia, while her story illustrates how one person can make a difference. Celia’s campaign comprises three facets. First, she hopes to draw ivory consumers’ attention to the plight of elephants in order to reduce ivory demand. Secondly, she focuses on educating young people about the illegal ivory trade, especially in China, because they have the greatest possibility to become future ivory consumers. Lastly, she wants to expand international attention on the issue. Already she has support from Jane Goodall, who has nicknamed her “The Elephant Girl,” as well as from over 40 other organizations. The following interview with Laurel Neme tells Celia’s story. You can listen to the entire conversation at Laurel Neme: The Wildlife Radio. To learn more about Celia’s campaign, visit her website Celia’s Corner and her Facebook page The Elephant Girl: Celia Ho. Laurel Neme: What got you interested in elephants? Celia Ho: I started to be interested in elephants when I first read the cover story written by Bryan Christy in National Geographic. It inspired me a lot. And I have also comprehended the troubles elephants are facing. That is why I started my campaign, to help them get out of this inhuman trench. Celia Ho: Firstly, I love elephants very much. That is one of the reasons why they are important to me. I love them because they are very intelligent animals. They have many emotions as well. They have a strong bond with one another. Actually, it was their character that has moved me to try to help them [as well as] the difficulties they are facing. Laurel Neme: What is your campaign to help elephants? Celia Ho: We are working on the first step: spreading the idea of an ivory ban. There are basically three parts of [my campaign]. The first part is drawing ivory consumers’ attention so that the demand for ivory can be reduced. And the second part is educating young people, especially in China, because they have the greatest possibility to become future ivory consumers. The last part is drawing international attention on this ivory trade issue. Laurel Neme: Are your friends now interested in the issue? Celia Ho: Yes, some of them are very interested in what I have been doing. I was very glad to explain the whole thing once again to them because I also got their supportiveness in return. Although some of them did not respond much, I thought this would be a special opportunity for them to understand the urgent needs of elephants. Laurel Neme: How are parents taking your campaign, including your own parents? Do they use ivory? Celia Ho: Actually, ivory can only be bought by rich people, and I and most of my friends are not very rich to afford this kind of luxury product. [My parents and my friends’ parents] support everything. Laurel Neme: Going back to your campaign, what are you doing to reduce demand for ivory and draw attention to this issue? Celia Ho: I tried different methods. For example, I have written many status [updates] on public platforms and social networks. I also write some letters to newspapers so they can publish my letters and help the idea spread. Because … [my message] may not reach my target [ivory consumers] by these kinds of methods, [I also focus on] the third part [of my campaign], which is letting their children, the young people, influence them. Educating young people is a very effective way to influence the consumers because parents pay more attention to what their children say. Laurel Neme: What are you doing with young people? 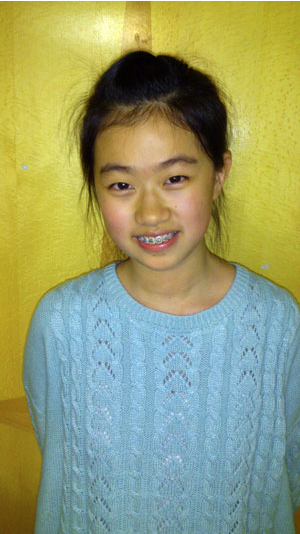 Celia Ho: The easiest method is approaching my classmates, of course, because we are friends already. I take every chance to share my campaign and the difficulties elephants are facing to them during school days. In addition to my friends at school, I also pay attention to friends that are in other social circles. Because everyone has many friends, that’s why I’m trying to ask all of my friends to help spread the idea. Then the power is going to [be] very powerful. Laurel Neme: How are you reaching other schools? Celia Ho: The first step is approaching schools in Hong Kong, because Hong Kong is an international city and it is also very near to China. I have approached three or four schools in Hong Kong, including mine, and I’m looking forward to approach more and more in China, because China is the place where huge demand is located. Laurel Neme: What has been the reaction when you approach the schools? Celia Ho: Honestly, some of them didn’t reply much. I was not surprised because this issue is not popular enough and my campaign is also not popular enough. But I will keep trying by showing them how important and urgent this issue is. And I am sure they are going to join us finally. Laurel Neme: How did you get the attention of Jane Goodall and various organizations, including Eco-Sys Action, who have been helping you? Celia Ho: I have to tell the story from scratch. I first sent a letter to the South China Morning Post, which is about the ivory ban. I did not expect any feedback. But it was surprising to see. A man called Christian Pilard [Founder and President of Eco-Sys Action] wrote back to me through the South China Morning Post by letter. I remember that day was a school day, and I just read the newspaper, just like I used to do, and it was very surprising to see so many supporting me and encouraging me. Their support also came along with many encouraging and positive words, which has spirited me up a lot because I know that I am never alone. There are so many people worldwide working on this issue. And our power is very powerful because we are all united. Laurel Neme: What can people do to help? Celia Ho: Everyone has his or her power, which is very influential. They can make good use of their social network, by maybe writing a status on Facebook or sending a letter to newspapers, just like I have done. They can also educate people around them and their parents, because they all have the possibility to become ivory consumers. Young people’s voices can be heard easily, and they are always noticed by others. I think their voices can be much more powerful than grown ups. I hope everyone can pay more attention to the farmers and the wildlife because most of them are facing difficulties caused by humans, development, or activities. I hope everyone can develop a sense of caring to our Earth by maybe reading more National Geographic to know more about our Earth in order to have a desire to help solve the problems we are now facing.